This post describes how to create a simple board game. It can be useful if you want to know how to create custom components, handle user touch. There are some interesting aspects we can consider in this app and they are described below. It can be used as example how to integrate different elements like SlidingPaneLayout, fragments, event handling and so on. The main android UI pattern used by the app is the Sliding Pane layout because we need to have the screen divided in two area: the main area is where we can play with our pegs and the other one that usually is closed is the menu. As you can notice the SlidingPaneLayout handles two fragments DreamPinTableFragment and MenuFragment. DreamPinTableFragment takes care of creating the table and handling the user touch so that the user can place pins on it, while the MenuFragment handles the some options like choosing the pin colors, save the work and so on. The peg board is implemented as custom layout. The class that implements it is called PinTableView that extends ViewGroup. 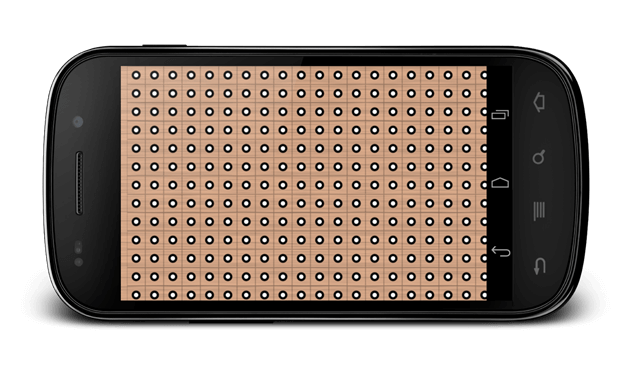 This custom layout takes care of dividing the UI screen in small cells that corresponds to the holes where the pegs are placed. The app screen is treated as a table divided in rows and columns. Notice that in this method we add PinImageView (another custom view) to the layout (line…) giving to them the right row and column number. As we saw before, we place in our layout a custom ImageView childs. PinImageView is a simple class that extends ImageView and represents a single Peg (or pin as we prefer to call it). This class has an internal state that holds the type of the peg it represents and implements some kind of animation to make the UI more attractive. Knowing the x and y coordinates we can calculate the corresponding row and column and set the peg with the right color. As we explained before the app has a menu where user can select the pincolor, save the work or change the table background. The class that handles the menu is called MenuFragment. This is very simple class, it just notifies to the main activity the events triggered when user selects a menu item. In turn, the main activity handle this event informing the other fragment when these event regards pegs or some actions that have to be taken on the table.